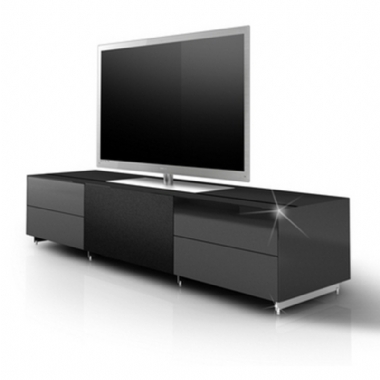 Spectral Cocoon TV Cabinet - As proud as you are of your multimedia equipment, that doesn’t mean you want to look at it all the time. Well, with Cocoon, the multifunctional media furniture from Spectral, you don’t have to. Cocoon offers plenty of space for integrating a wide range of sound systems. To connect all cables, simply remove the magnetically attached glass shelf. Cocoon by Spectral can be expanded in a variety of ways to provide the ideal solution which ticks the boxes of the HiFi and AV buffs yet carries the cutting-edge appearance of the Spectral marque. Different sized cabinets can be placed end-to-end with hairline almost-invisible joins with scope to integrate as much tech as you can possibly think of. One of the most common restrictive aspects of enjoying high-end audio are cabinets with a lack of generous space. Cocoon with its 51cm deep shelves provide enough depth to accomodate large AV receivers and amplifiers. In contrast to the high-gloss painted surfaces of other furniture items, the glass surfaces of Cocoon are considerably brighter, more scratch-resistant and much easier to look after. Cocoon is available in over 2,000 colours. Glass side panels in the same colour come as standard although if joining COCOON units together to form a bespoke cabinet glass side panels can be removed by request.